London Saxophone Festival 2018 | Music Mark The London Saxophone Festival 2018 is the first of its kind, in celebration of the saxophone through concerts, film, workshops and more. 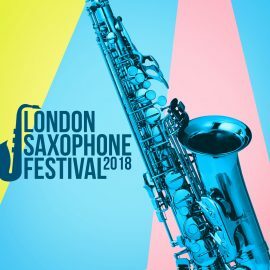 The London Saxophone Festival 2018 is the first of its kind. A festival experience, in celebration of the saxophone through concerts, film, workshops and more, bringing together lovers of the saxophone, worldwide musicians, music fans and students alike. The pioneering festival is for Londoners and visitors to celebrate, appreciate and learn more about the saxophone. It will also provide a platform for saxophone players and non saxophone player to collaborate, showcase and play the instrument.The unique festival will celebrate the saxophone with an array of concerts, representing a wide range of musical styles and genres. The Festival will take place between the 21st and 27th May 2018, at numerous venues across London. Partners so far are: Jazz Fm (as Media Partners), Sax.co.uk (for workshops), Yamaha, Cambridge Audio and loads more. We have events currently booked at Cadogan Hall, Jazz Cafe, Pizza Express, Vortex, Everyman Cinema, etc. Hedliners confirmed so far are Grammy Award Winners Bob Reynolds (from Snarky Puppy) and Casey Benjamin (from Robert Glasper Experiment). The Free entry Sax Village will run on the 26th May 2018 in the foyer of Cadogan Hall in Sloane Square from 11am to 8.30pm. It will be an amazing opportunity for manufactures, music brands, lifestyle brands publishers and loads more to showcase their brands amongst a mixed audience, of saxophone enthusiasts and general members of the public. The Sax Village will involve concerts for children, opportunities to try out a saxophone for the first time and loads more.